I’m pretty sure I was just flirting at Trader Joe’s. It happened in the dried fruit and nut section. I was on my tip toes trying to see if they’d stocked more medjool dates. They hadn’t. Never again would I assume that because I loved something, Trader Joe’s would have it. My disappointment was immeasurable. To compensate, I adapted a buying technique akin to the Michigan Militia shopping at Costco and placed five packages of uncrystallized ginger, the next best thing after medjool dates, into my shopping basket. There he was. A guy with bigger hair than mine and a declared love for ginger. As young, urban hipsters with big hair, our conversation subtly switched from ginger to socio-cultural things people do in the city. He liked stuff. And going out and doing stuff. 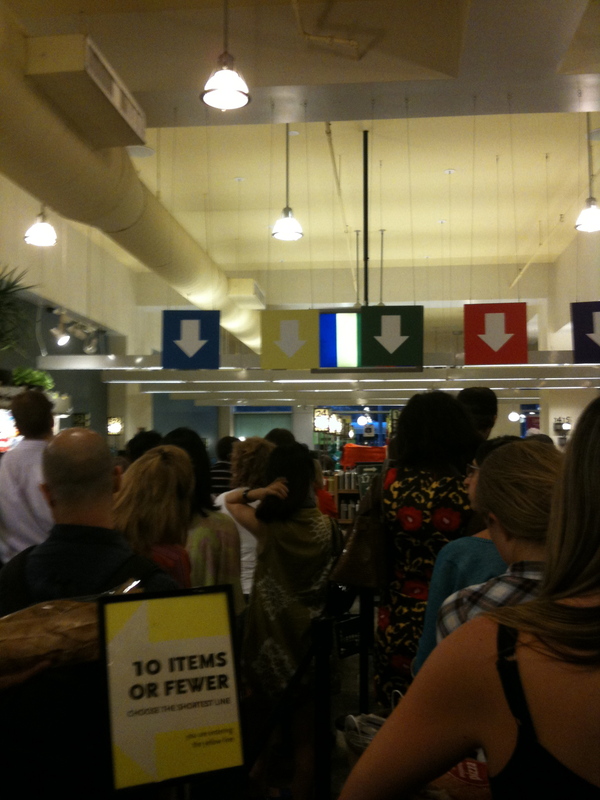 My evolving fantasy was difficult to maintain among the chaos of shoppers. We had to reposition ourselves and constantly apologize for being stationary in the sea of movement. It was absolutely impossible to gauge how much ginger I could eventually fit inside his mouth, if given the opportunity. I took a step back and almost crashed into a pregnant woman reaching for walnuts. His innocent statement was akin to sleeping with a virgin. How should I react? Should I try to keep the myth of Trader Joe’s alive? Didn’t he know that we were participating in the post-advanced capitalist experience of consumer mythology? True, I was also shopping there, but I was already corrupt. The moment faded. I concluded our conversation by mentioning that uncrystalized ginger was considered too ‘spicy’ by some, wished him well on his shopping journey, and made a move toward the coffee and vitamin aisle. Here in New York, most people I know are over the allure of Trader Joe’s. Although we still succumb to the slogan that “The line,” which usually snakes down the aisles and out to 14th street, “is worth the savings,” most of us do so begrudgingly. It had been many months since I had shopped at Trader Joe’s. But, a few weeks ago, I received a $100 dollar gift card for Trader Joe’s, because I got a real job. Both the job and the gift card were pretty cool. $100 doesn’t go far in New York, but it does at Trader Joe’s. Before I knew it, I was back in line. 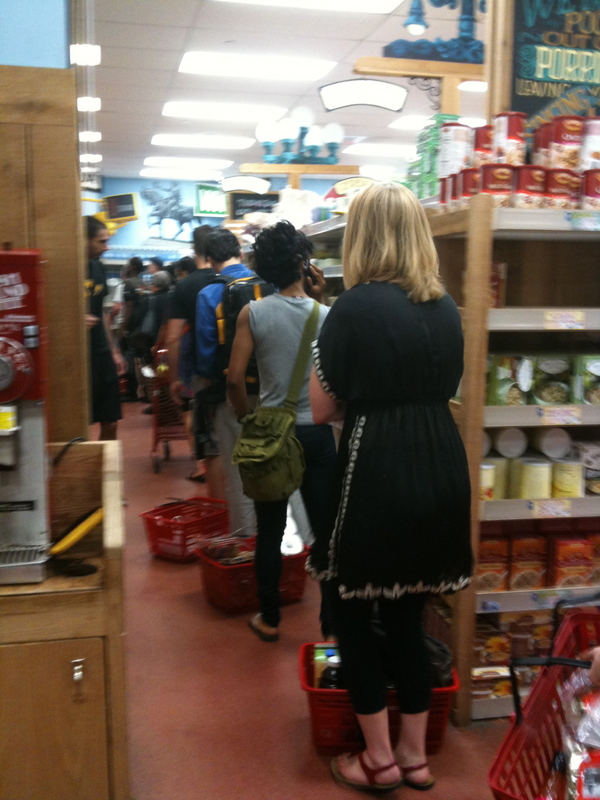 Waiting 30 minutes to buy twelve or less items of real inconsequential nutritional value may seem absurd in the moment. But the obnoxious cow bell that rings incessantly at the check out, the uncomfortably close contact with OPSB (Other People’s Shopping Baskets), and aggressive spatial behavior required to get your products all dissipates as soon as you get home and have a pound of Dark Sumatra, organic Greek-style yogurt, and matcha-covered almonds sitting comfortably on the shelf. Everything about Trader Joe’s, from the free samples, ridiculous cheap prices, disturbingly friendly staff, and self-branded ‘neighborhood grocery store’ is in fact capitalism at it’s best. Calling TJ’s a grocery store is somewhat misleading. Like capitalism, it has a lot of choice but no real sustenance. Shopping there does not necessarily add up to a complete meal. The capitalist beauty of Trader Joe’s is the wide range of products that help build up a culinary identity. Flax seed tortilla chips and guacamole for a casual rooftop party, prepackaged lox, plain cream cheese (note bagels and chives are nowhere to be found), and sparkling grapefruit Italian soda for a lovely Sunday Brunch. The overall identity is akin to an old-time General Store. The brown paper grocery bag alludes to a pastoral pre-industrial nostalgia. 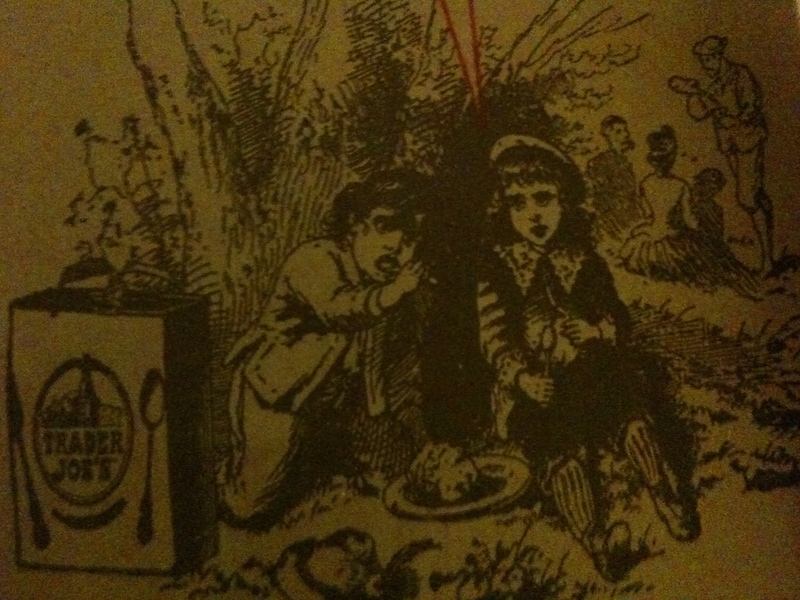 We look at the boy and girl in their jumpers and pantaloons, remember all that French cheese we just bought and conclude, hey, I could go on a picnic too! However, the reality of TJ’s is neither pastoral nor industrial–it is the beauty of post-Fordist retail systems, a time where people are less concerned with ‘keeping up with the Joneses” and more concerned with being different from the Joneses’. We engage in democracy through consumption, and the ability to choose what we consume. With their high level computerized stock-taking systems, supermarkets represent one of the key institutions of post-Fordist democratic consumption. Murray describes it as an emphasis that shifts away from a manufacturers’ economy of scale to a retailers’ economy of scope (1989, 43). The result is, according to cultural studies professor Jim McGuigan, a discriminating consumer (1996, 89). We feel both entitled to and empowered by the choices we make. The ability to bridge the gap between the fiction of Trader Joe’s as a neighborhood grocery store and the reality of a massive global operation lies in the magic of the TJ’s associates. These men and women are trained to be incredibly friendly, helpful, and personable, just like your old fashion general store owner, you know, the man or woman who always pre-ordered you a shovel and knew the type of calico you preferred. TJ’s is most akin to the general store in the way that stock selection is unpredictable and fluctuates according to market demand. Like all good 21st century shoppers, most TJ’s customers have specific items they come in for. 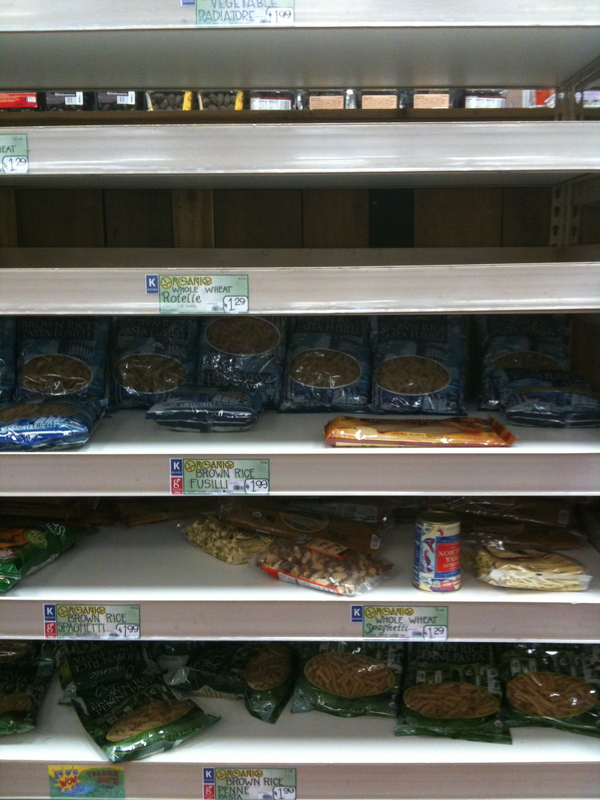 It’s easy to become frustrated when half your food items are not available. A fellow classmate of mine has a noticable difficulty pulling marathon sessions in the computer lab when Trader Joe’s is out of their low-salt trail mix. Legend has it that the Manhattan branch Trader Joe’s hires only actors and actresses. These associates, in their red tropical shirts, do a wonderful job pacifying irate customers. They’ve developed an uncanny ability to take one look at a shopper’s baskets, summarize his or her personality, and direct the topic away from the missing food item. They talk about films, make some self-deprecating yet humanizing comment, suggest another food item, and then subtly direct the customer to the check out. In short, they work magic. Less than a block is Whole Foods, which has far more selection but equally long lines, pistachios that cost three times more, and unsympathetic associates. A few years ago, Whole Foods earned the nickname “Whole Paycheck” for their posh identity. Although the company has worked hard to change this, their self-branding is significantly different from TJ’s. 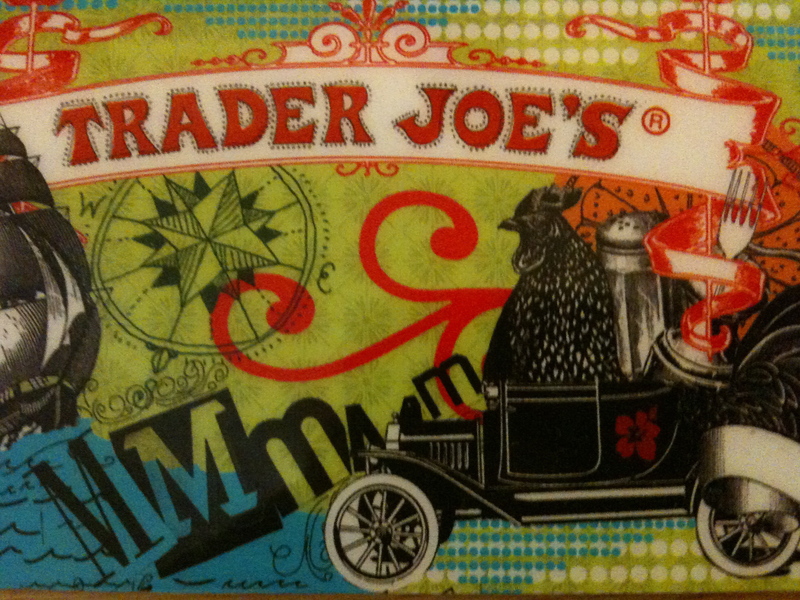 Trader Joe’s success lies in the company’s suspension of disbelief. Our shopping experience is somewhere between the elitism of Whole Foods and the proletariat savings of Walmart, Farmer Jack’s, Associates, C-Town, or Food Bazaar. Feeling empowered by choice allows us to flirt with capitalism and causes us to ignore the underlying hegemonic systems of reproduction. Murray, R. (1989) New Times-The Changing Face of Politics in the 1990s. London: Lawrence & Wishart. ← The City, a State of Mind?